While most people first provide for their spouse and children in their estates, some people also want to leave a legacy of giving to causes that are close to their hearts and that can make a change in the world. Other people may prefer that most, if not all of their estates pass to charities because they do not have close family members, or because of strong attachments to particular charitable organizations. No matter what cause you support, charitable giving can benefit many people in New York, across the country, and even throughout the world. However, charitable giving can also benefit you and your family if you plan correctly and use the right estate planning tools. The United States tax system supports charitable impulses and generous giving, allowing income tax deductions for donations if you itemize your taxes. The Tax Cuts and Jobs Act may mean that fewer people will itemize in the coming years, so immediate tax benefits may not be available. However, higher income taxpayers, as well as people concerned about estate taxes can take advantage of charitable giving both to do good for society and to do well for themselves and their loved one taxwise. No matter what your financial situation may be, charitable planning may benefit you and your estate. The following are only some of many tools for charitable planning. Charitable remainder trusts – When you set up a charitable remainder trust (CRT), you may transfer highly appreciated assets, such as real estate or stock, into the trust and choose a time period. The time period can be for a set number of years, for your lifetime, or for someone else’s lifetime. Each year during that period, the trust will make a payout to you or a different noncharitable beneficiary. When the time period ends, the remaining assets and any appreciation go to the charity of your choice. You avoid paying capital gains on the trust assets until you actually receive distributions, so the trust receives the full fair market value, which means both the noncharitable beneficiary and the charity receive more. Charitable lead trust – A charitable lead trust (CLT) is like a mirror image of the CRT. You transfer highly appreciated assets and select a time period. However, the trust will then payout to your selected charity each year, and the remainder will go to a noncharitable beneficiary (or the donor) at the end of the trust period. The CLT offers similar benefits and flexibility as the CRT. 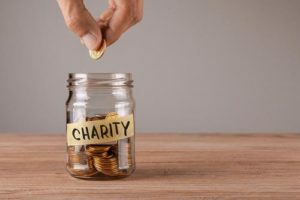 Charitable gift annuity – A charitable gift annuity is similar to a CRT, however, you donate cash, securities, or other assets to the charity initially. The charity then holds the contribution in an investment account, which provides payouts to you for the rest of your life before the charity receives the remainder. The initial contribution may be eligible for a tax deduction and distributions may be only partially taxable. Pooled income trust – Think you must be extremely wealthy or have high-value assets to reap the advantages of charitable trusts? This is not the case, as you may a pooled income trust as a charitable planning tool as long as you meet a minimum initial donation, which can be as low as $5,000 in some cases, and smaller subsequent annual contributions. A charity sets up the trust and accepts contributions, pooling the funds and investing them. You then receive income based on the return investment, much like mutual funds. You receive a tax break for your donations, benefit a good cause, and build up additional income. You can also defer taxes on contributions of appreciated securities though you may not donate real estate to a pooled income trust. Donor-advised fund – You may donate assets to a donor-advised fund, which then invests the assets to hopefully earn more funds for the chosen charity. While a donor-advised fund does not provide an income stream for you or beneficiaries, it does provide tax deductions for your contributions, avoidance of capital gains taxes on highly appreciated assets, while permitting you to retain substantial control regarding the charities that will ultimately receive contributions and the timing of such contributions. Private Foundations – Wealthier taxpayers may also consider establishing a permanent philanthropic vehicle – a private foundation. A private foundation can be used to engage families in philanthropic projects in perpetuity while providing immediate tax deductions. A private foundation can also be the recipient of contributions as part of a family’s estate plan, including from other planned giving devices and bequests in your family members’ wills. Many people often use the above tools as part of charitable planning. If you want to leave a legacy supporting causes that are important to you, you should carefully consider which option is best for your current financial situation and long-term financial goals. Many of these trusts, annuities, and funds have complex requirements or caveats, so be sure to discuss each one with an experienced legal professional who fully understands the full array of options and their implications. At the law firm of Goldfarb Abrandt Salzman & Kutzin LLP, our elder law and trusts & estates attorneys regularly help New Yorkers with charitable giving. We listen to the goals of our clients and design a plan to achieve them. To discuss the many ways we can assist with charitable and estate planning, call (212) 387-8400 or contact us online to set up and appointment.